경상남도 산청군 단성면 사원리의 절터에 묻혀 있던 것을 1957년에 경남 진주의 금선암(金仙庵)으로 옮긴 것이다. 불상을 안치한 대좌(臺座)와 불상 뒤의 광배(光背)를 모두 갖추고 있으나 무릎 부분을 비롯하여 많은 부분이 깨진 상태이다. 머리에는 작은 소라 모양의 머리칼을 붙여 놓았으며 머리에 비해서 얼굴이 지나치게 길다. 어깨는 넓고 당당하나 허리를 너무 잘록하게 표현하여 어색한 느낌이 드는데, 이러 불상의 모습은 통일신라 후기에 유행하던 특징이기도 하다. 현재 무릎 부분이 깨졌기 때문인지 비례가 잘 맞지는 않지만 넓은 어깨, 당당한 가슴 등에서 박력있는 형태를 보여준다. 옷은 오른쪽 어깨를 드러내고 왼쪽 어깨에만 걸쳐 입고 있는데 옷주름에는 형식화가 심하다. 오른손은 손끝이 땅을 향하고 있으며, 배꼽 부근에 놓인 왼손에는 약합이 들려 있다. 따라서 이 불상은 약사여래불을 형상화한 것으로 보인다. 바깥 부분이 거의 깨진 광배에는 연꽃무늬, 구름무늬, 공양 올리는 모습 등이 새겨져 있다. 8각의 대좌에는 보살상과 신장상, 큼직한 연꽃무늬 등이 조각되어 있는데, 이 역시 통일신라 후기의 양식적 특징이라 하겠다. 아무튼 이 불상은 박력있는 통일신라 후기 불상의 귀중한 예로서 높이 평가된다. 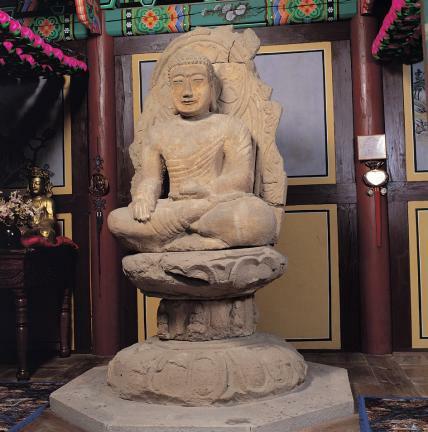 Originally buried in the temple site in Sawol-ri, Danseong-myeon, Sancheong-gun, Gyeongsangbuk-do, this stone statue was moved to Geumseonam Hermitage in Jinju, Gyeongsangnam-do in 1957. 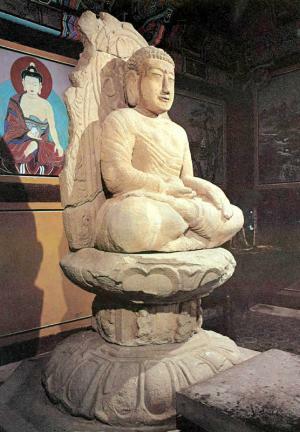 The pedestal supporting the Buddha statue and the mandorla (Buddhist halo of light) behind the statue all remain but many parts including the knees are damaged. The head has a curly nabal style (i.e. twirled up and around in a seashell-shaped fashion), and the face is too long compared to the head. The nose and ears are long, and the neck is fairly short. The shoulders are broad and dignified but the waist is slim, giving an awkward impression. 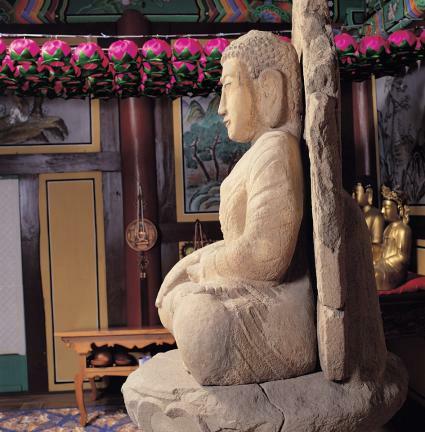 This style of statue was popular in the late Unified Silla Period. At present it is unbalanced because the knees are damaged, but the broad shoulders and dignified chest are impressive. 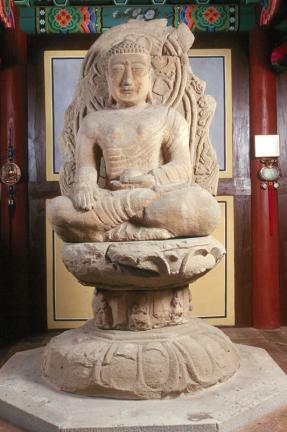 The beobeui (sacerdotal robe) is hanging to show the right shoulder, but the ripples on the clothing are too formal. The tip of the right hand is pointing towards the ground and the left hand, which is set on top of the knee, is holding a medicine case. 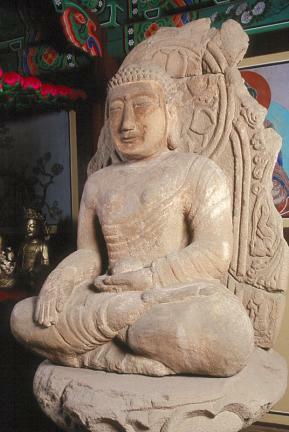 Therefore this statue is thought to be a Bhaisajyaguru Buddha. 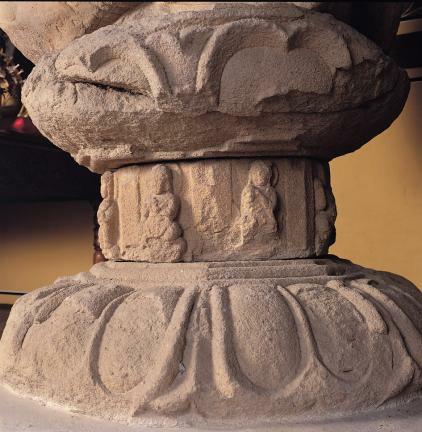 The mandorla, with its outer parts almost shattered, features lotus and cloud patterns and images of presenting offerings. 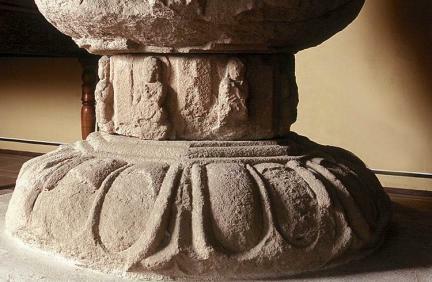 Bodhisattva figures, statues of guardian deities, and large lotus patterns are carved on the octagonal pedestal. 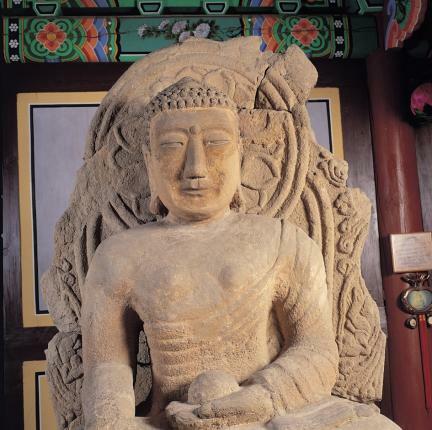 The statue was made with a carving method from late Unified Silla, and is a valuable example of the kind of bold statues made during that period.